The BB,CC,DD and E refers to mouldings similarly labelled thus on drawing . 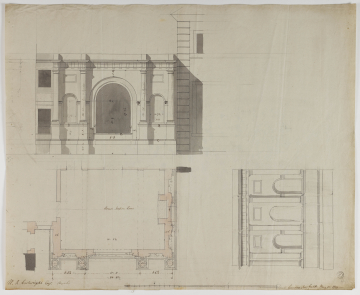 The pencil note 'Old Columns, Base & Capital' indicates that Soane re-used existing parts. Earlier drawings ([20, 22, 25]) show the arch leading to a court in the offices wing; drawing  has the arch fronting the butler's pantry.This design shows that the housekeeper was fortunate to have such a large room, double height and 21 feet 1 ½ inches wide, with a good-sized chimney-piece and a large arched window.